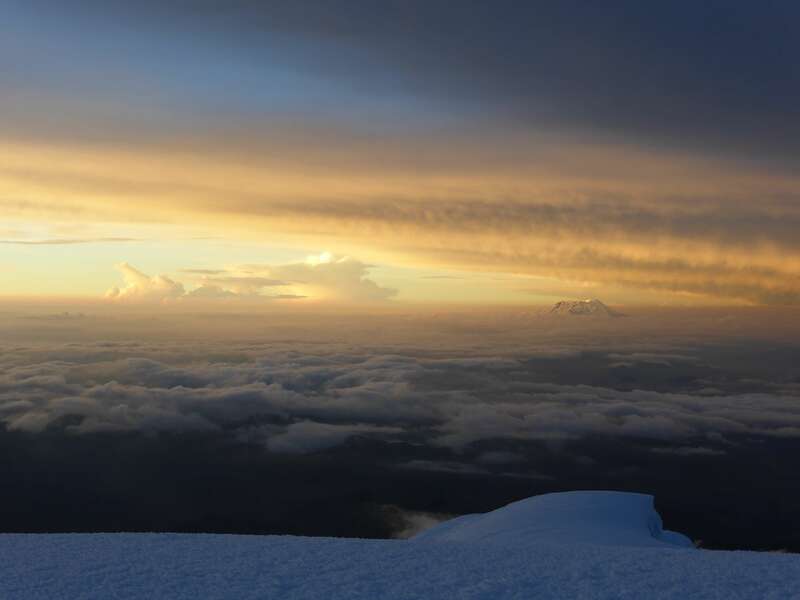 Cayambe, seen from the summit of Cotopaxi at sunrise. 5790m Cayambe is Ecuador’s 3rd highest mountain. A massive extinct volcano, Cayambe is known for its active glacier and inclement, windy weather. Interestingly, part of Cayambe is located on the earth’s equator, making it the highest point through which the equator directly passes. 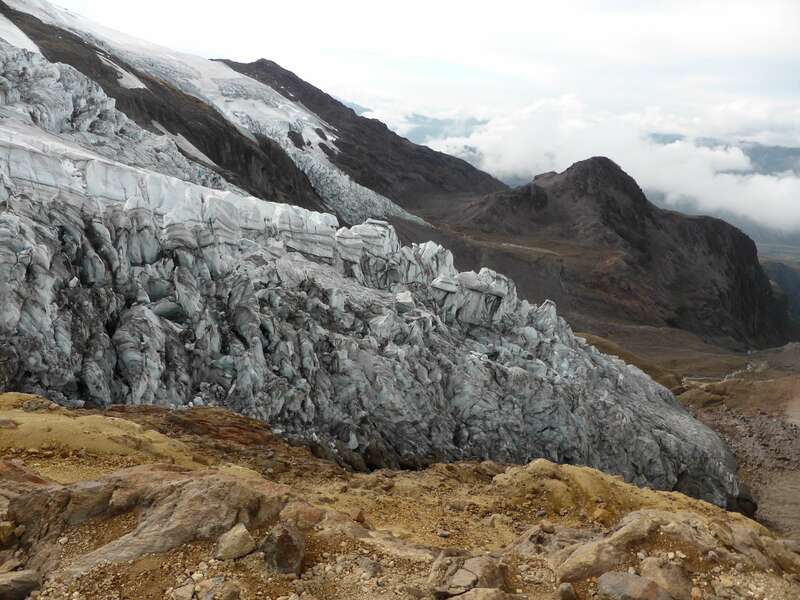 The eruptions of Reventador, a nearby volcano with high activity, and the subsequent ashfall onto Cayambe’s glacier, have given Cayambe a reputation for being icy and out of condition. Cayambe, from near the refuge. 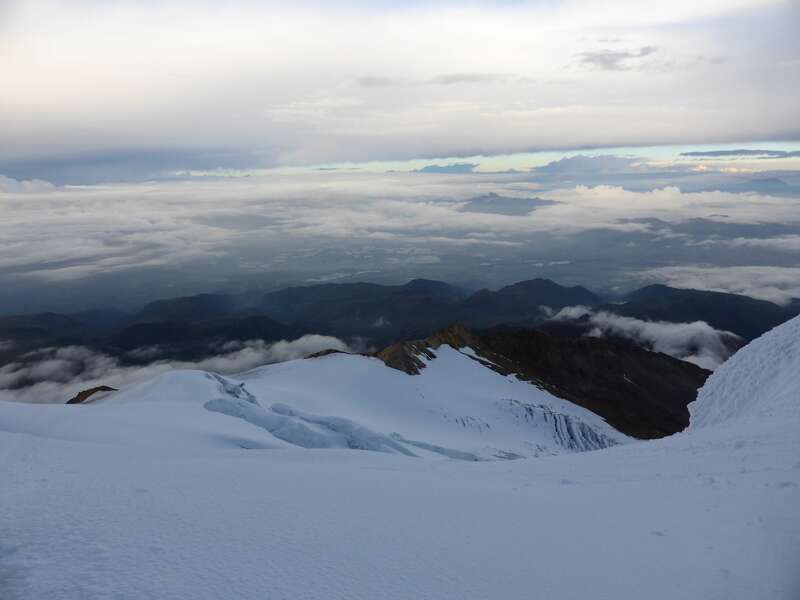 I climbed Cayambe on my eighth day in Ecuador. Prior to climbing Cayambe I had hiked 4791m Corazon, climbed both of the 5000+m Illiniza volcanoes, and spent several nights sleeping at 4700m. 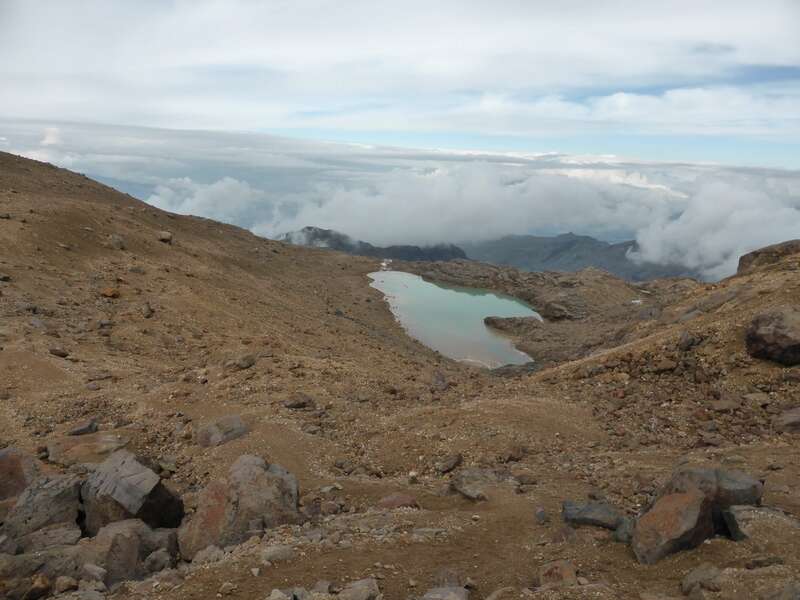 A week spent hiking at altitude before visiting Cayambe made for great acclimatization, no altitude-related issues, and a far more enjoyable climb. My acclimatization and climbing itinerary can be seen here. Ash on the lower glacier. Day 1: The climb began at my hostel in Machachi, where my Ecuadorian climbing partner and mountain guide Pato picked me up in his 4×4 truck. 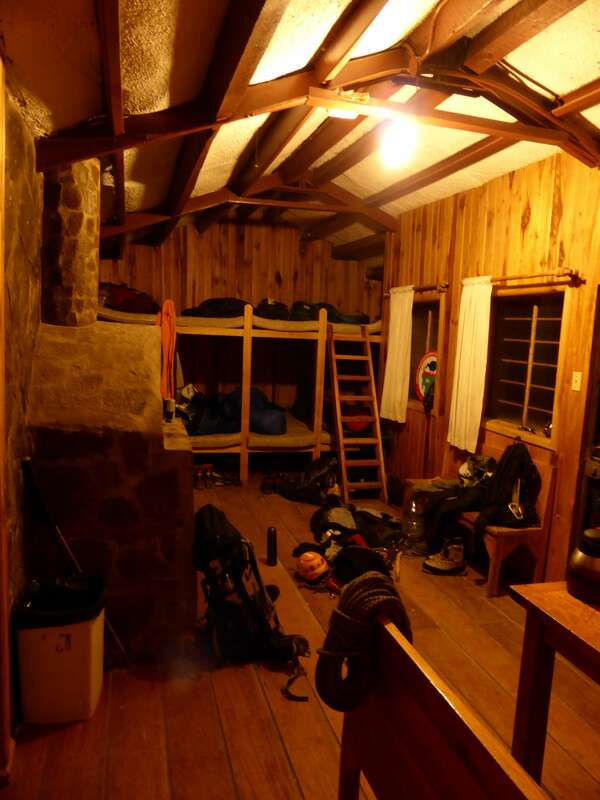 While Machachi is not particularly close to Cayambe, I was very pleased with the hostel there and had opted to stay rather than move for one night. 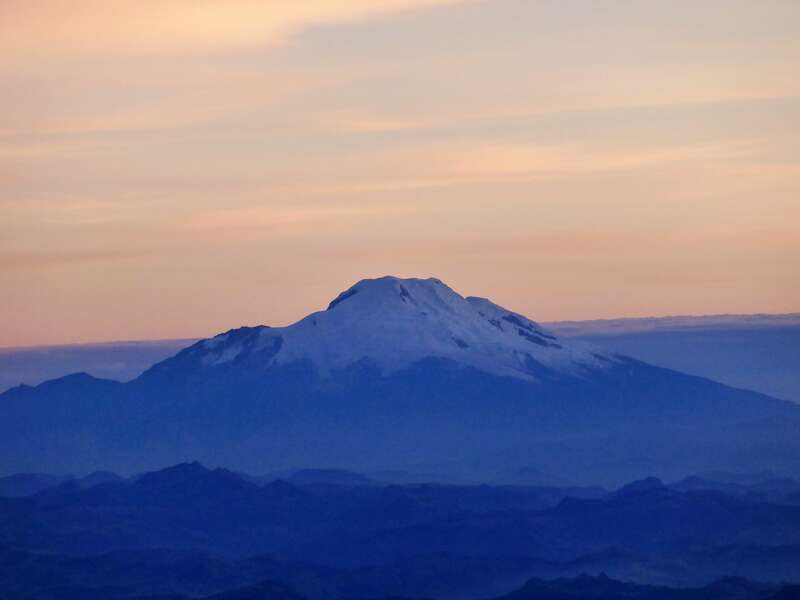 Machachi’s proximity to the Illiniza and Cotopaxi national parks makes it a popular base area for visiting climbers, and its location is close enough to all of Ecuador’s major peaks for one to stay there prior to other climbs. From Machachi we drove for roughly two hours to the town of Cayambe, stopping for food and drinks along the way. From the town of Cayambe we drove east, towards the Cayambe Coca Ecological Reserve which contains the mountain. From town the road followed rolling hills alongside deep valleys, brimming with trees and plant life. The area near the reserve is very rural, and we passed many farms and pastures built along the valley walls. 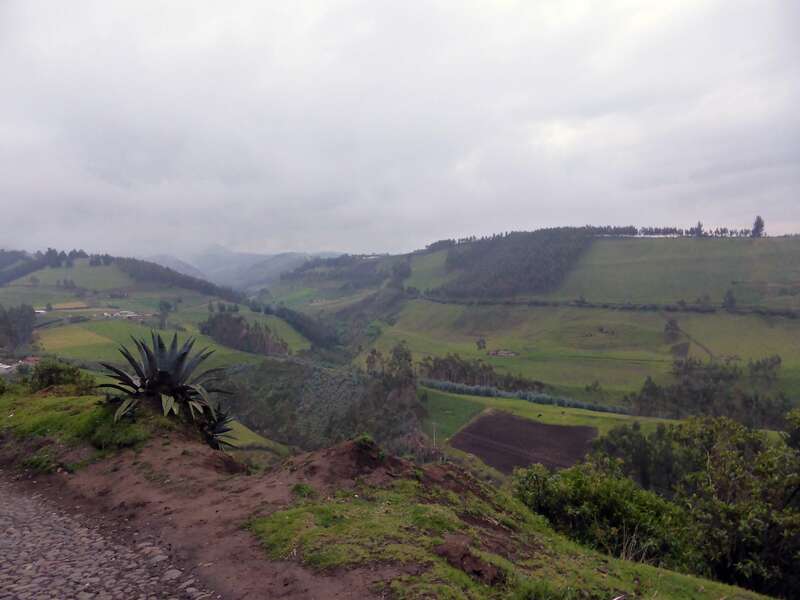 Driving to the base of Cayambe, through the rural area east of the town of Cayambe. At the end of a rough road we arrived at the base of Cayambe and parked by the mountain cabin, or refuge, where we would spend the night. 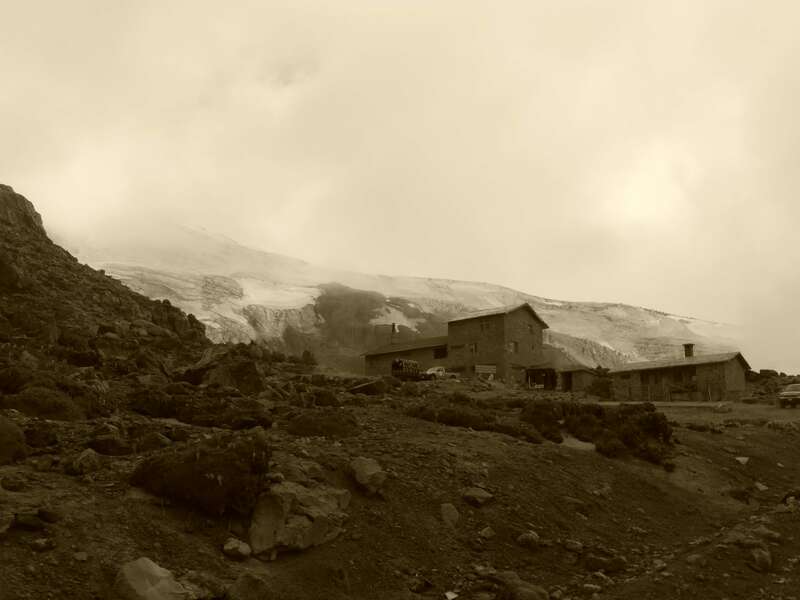 At an elevation of 4600m the refuge is a convenient resting place to base a climb out of. The main refuge building was under construction, but a smaller building to the right of it was open. 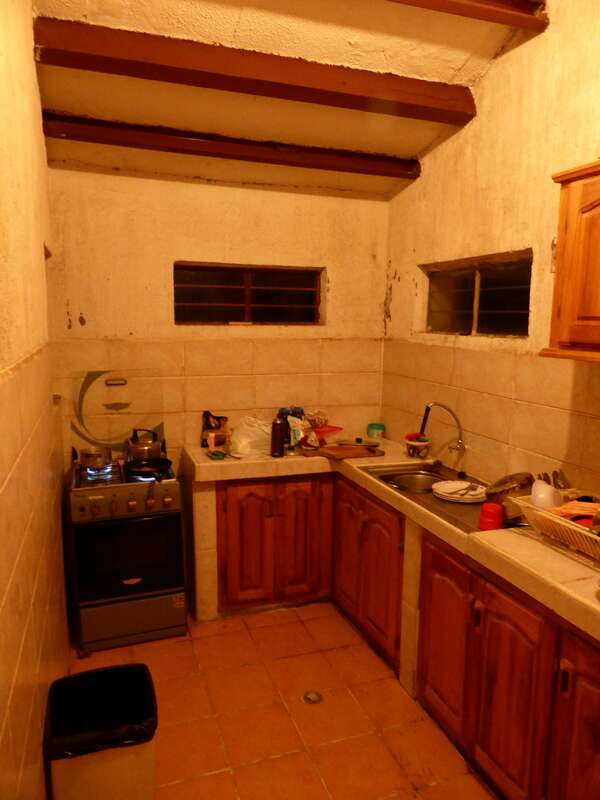 It cost around $20 for the two of us to stay for the night. 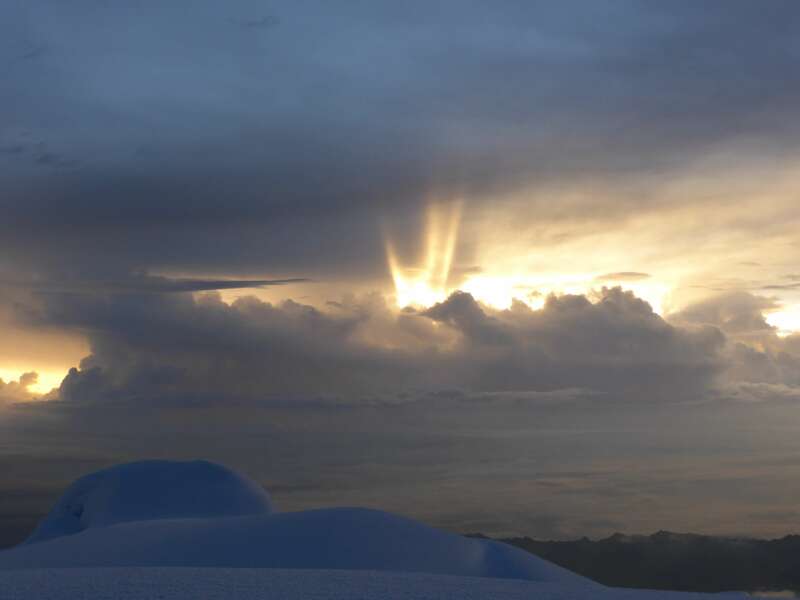 The Cayambe refuge. The larger building to the left was being renovated, but we were able to stay inside the smaller building beside it. The refuge was small but comfortable, with a kitchen, running water, a little gas stove and padded bunks. Luxurious compared to camping! A pair of Austrian climbers and their guides had descended earlier in the day, but had opted to spend another night sleeping here for acclimatization. They shared good news, and told us that the glacier was in great condition. After cooking some food and organizing gear for the next day, we went to sleep early. Day 2: Awake around midnight, we began hiking in the dark at one o’clock a.m. The sky was clear of clouds, and stars glowed brightly above us. 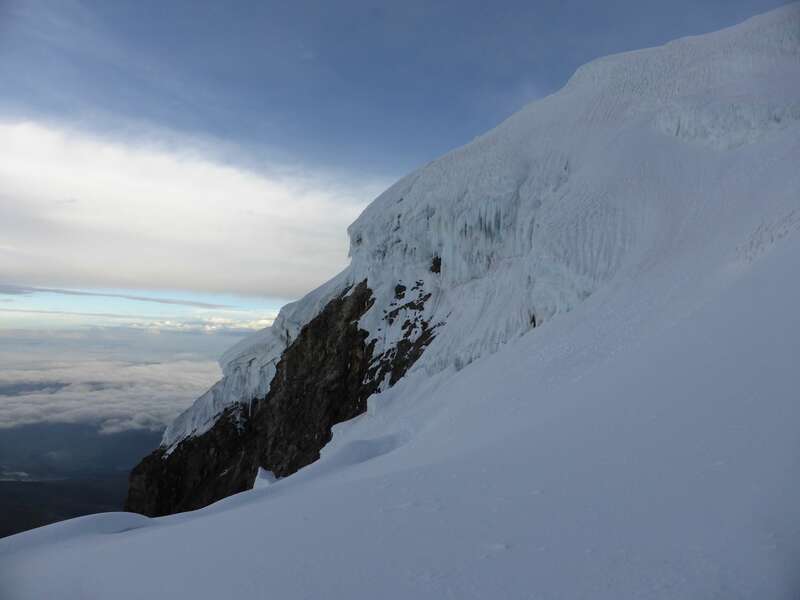 The standard route on Cayambe begins by following a ridge of dry rock located to the left of the refuge when facing the mountain. This ridge leads up, around, and onto the glacier, bypassing the complicated icefall of the lower mountain. Descending back along the rock ridge used to reach the glacier. From the top of the ridge the glacier was level with the rock and easily accessed. 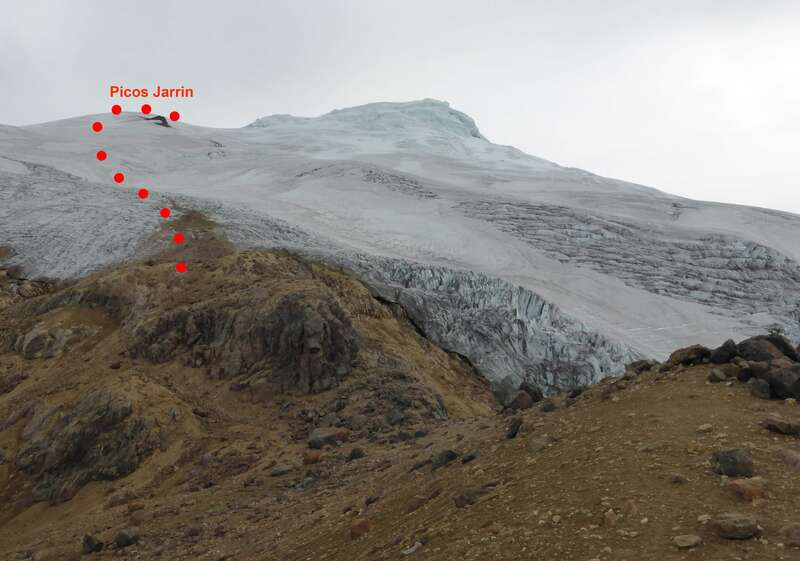 Once we reached the lower glacier we began to navigate upwards, crossing several crevasses and avoiding others, towards a rocky outcrop called Picos Jarrin. The lowest portion of the glacier was covered in debris, and was riddled with shallow half-meter deep cracks. Our route above the ridge, climbing to the left of Picos Jarrin to avoid crevasses. 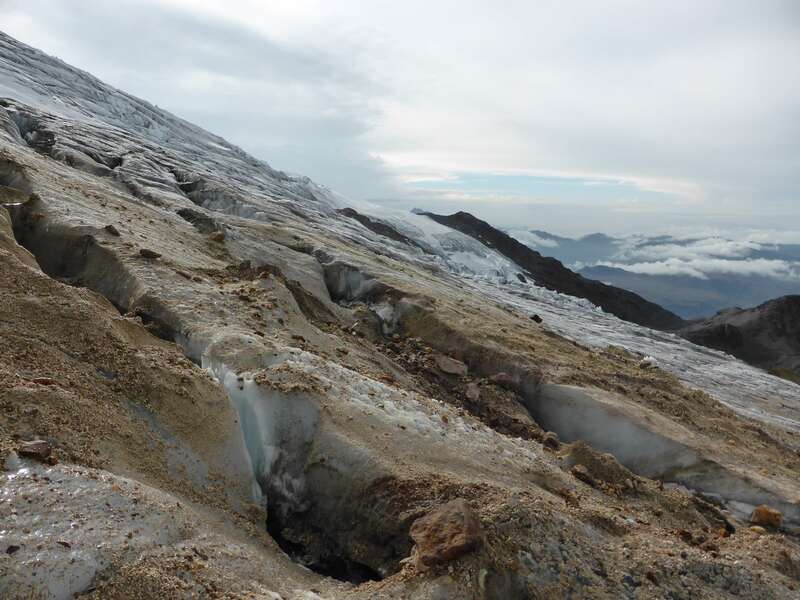 The glacier near the ridge was covered in rock debris and shallow crevasses. Above Picos Jarrin a series of snow ramps wound past vertical ice cliffs towards the summit, keeping to the climber’s right of a large, prominent rock cliff. Looking up Cayambe during our descent in daylight. The prominent rock cliff in the top left corner serves as a useful landmark, as the route ascends just to the climber’s right of it. The rock cliff off route. The climbing was physical and sustained, but enjoyable under a clear sky and on perfect snow. Aside from two short traverses the ramps on the upper glacier were roughly 40 degrees at minimum. At its steepest the route sharpened to around 60 degrees for a few stretches of 10-15 meters, requiring front pointing and careful ax placement. 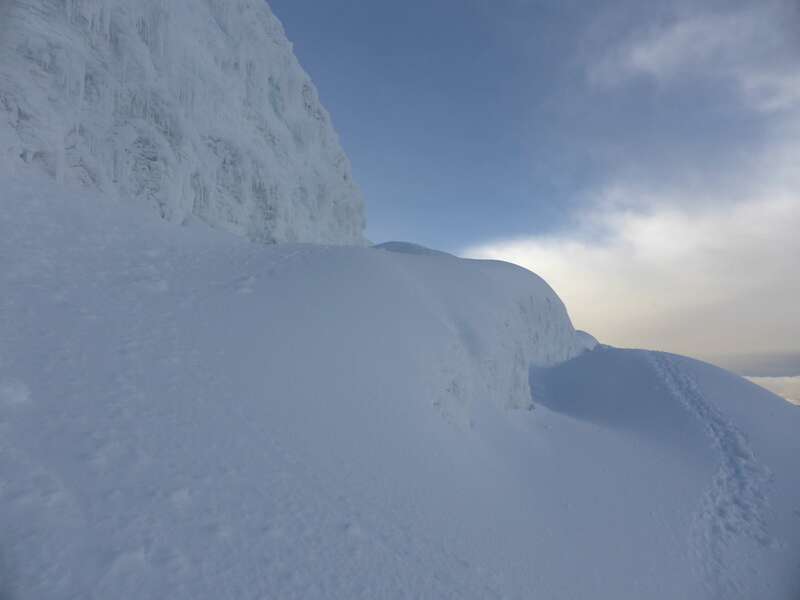 Because of the snow conditions we did not place any pickets for fall protection, although the final ramps to the summit were not without objective hazard due to the enormous ice walls hanging above them. Huge ice walls loomed above the upper route. One of two level traverses below the ice cliffs. As we approached the top the sun began to rise. Our timing had been perfect, and we gained the summit at exactly six o’clock a.m., five hours after leaving the refuge. Cayambe’s summit is a large flat dome and was exposed, windy, and bitterly cold. In the distant east an enormous thunderstorm flashed with lightning, the sun rising behind it painting the sky to create a surreal, awe-inspiring view. 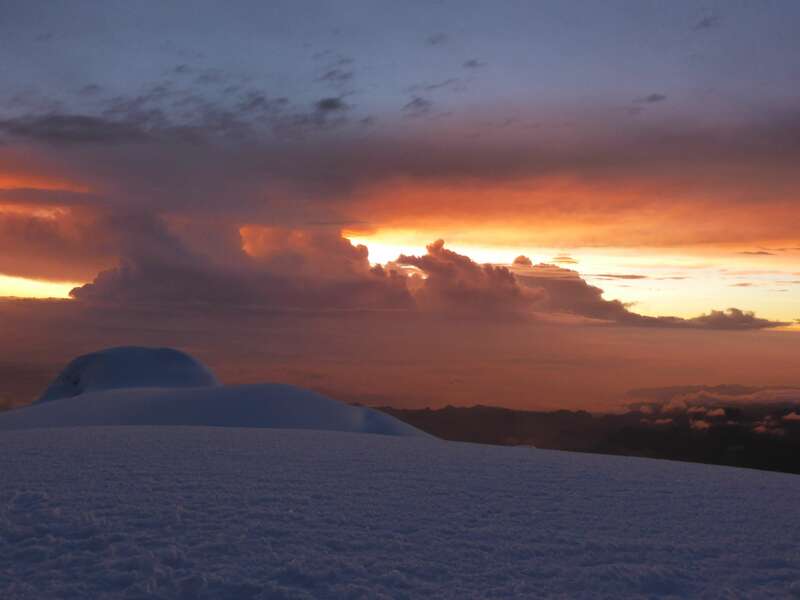 Sunrise on the summit of Cayambe. 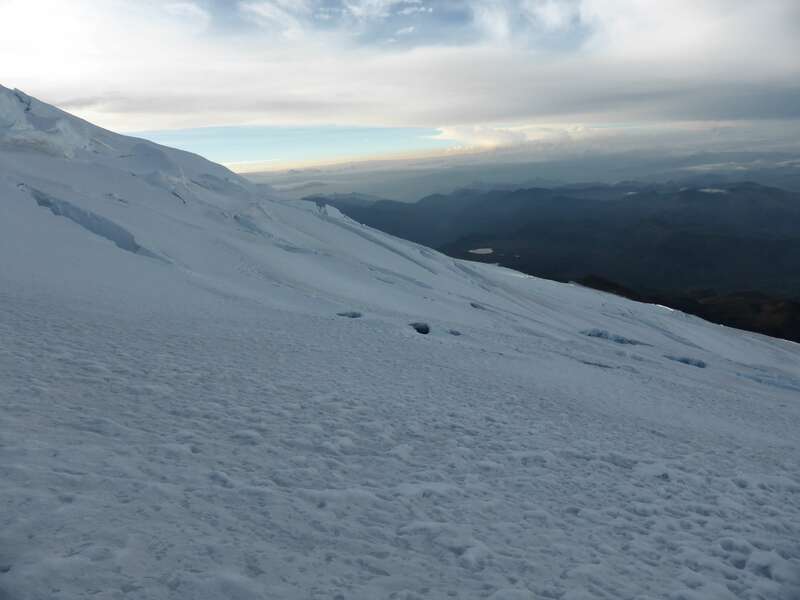 Standing on the summit of Cayambe. 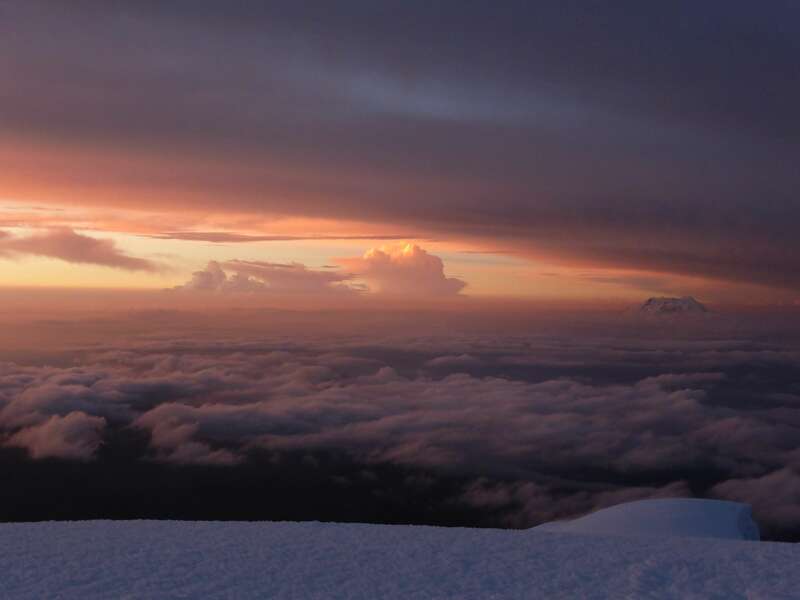 Antisana, Ecuador’s fourth highest, rose above the clouds and glowed purple in the rising sun. 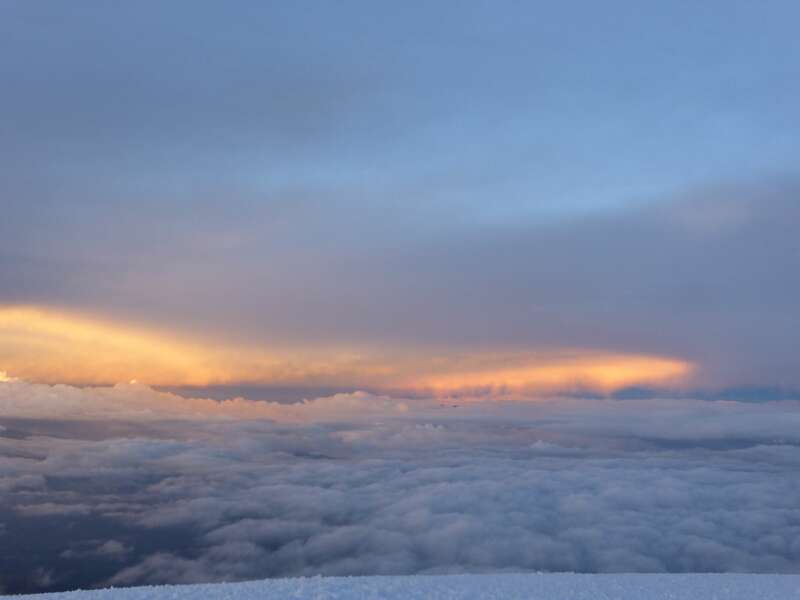 Antisana, from the summit of Cayambe at sunrise. 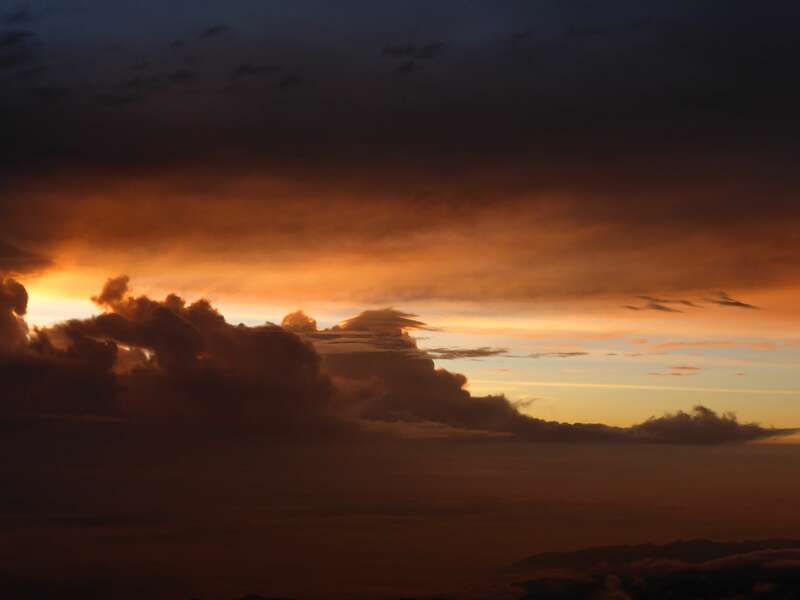 As the sun rose above the thunderclouds the colors shifted from shades of purple, to orange, to a familiar yellow glow. 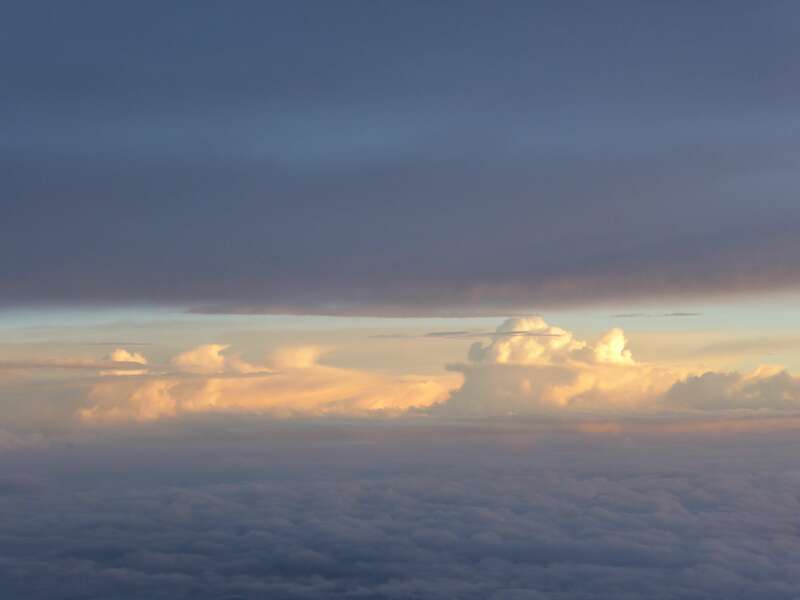 As the sun finally broke above the clouds, soft pastel colors glowed throughout the cloud ocean stretching below us. After almost forty minutes on the summit, we began to descend. We were lucky to enjoy perfect, firm snow, allowing us to move quickly and without difficulty. On the way down we encountered a team of two other climbers who were still heading up. Looking down Cayambe. As we descended another team was climbing upwards. The below image depicts the crux of the route, the top section below the summit, as seen during our descent in daylight. When the photograph is enlarged the other climbing team can be seen ascending, giving a sense of scale to the terrain. Looking back up the route. 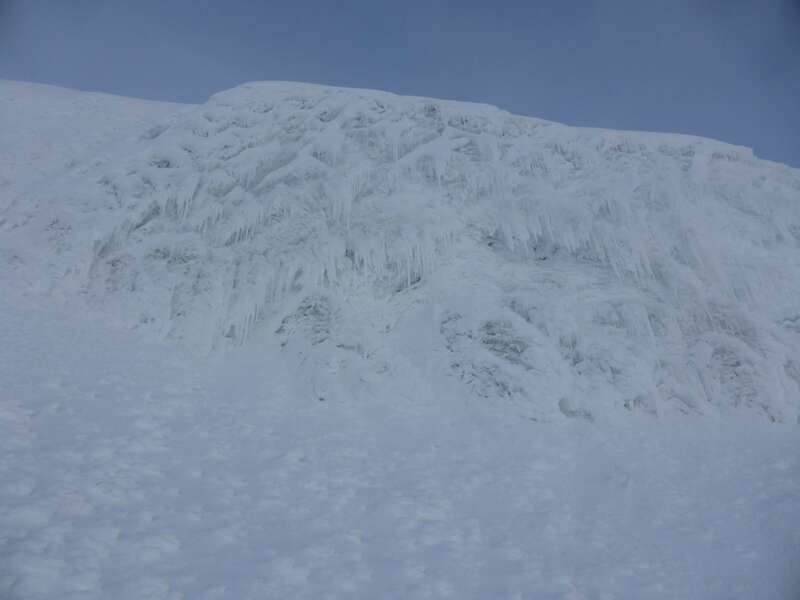 Several massive ice walls stand above the steep ramps which lead to the summit. The other climbing team is still ascending, giving scale to the terrain when the image is enlarged. The temperature rapidly warmed up as we descended, and we stopped several times to shed layers. Looking across the lower glacier. Finally we reached the base of the glacier, where we regained the rock ridge which we had hiked in the dark. In daylight the lower glacier was particularly impressive, with layers of volcanic ash visible where the glacier had cleaved. The snout of the glacier, layers of ash visible in the ice. A level area near a small lake on the top of the ridge would have made an excellent location for camping. A small lake on top of the ridge. After an easy descent we reached the refuge at around nine o’clock, where we had a quick snack before packing up our equipment and driving back to Machachi. Our plan for the next day involved driving to Cotopaxi National Park where we would begin an attempt on Cotopaxi at around midnight, so we were both eager to get some rest! 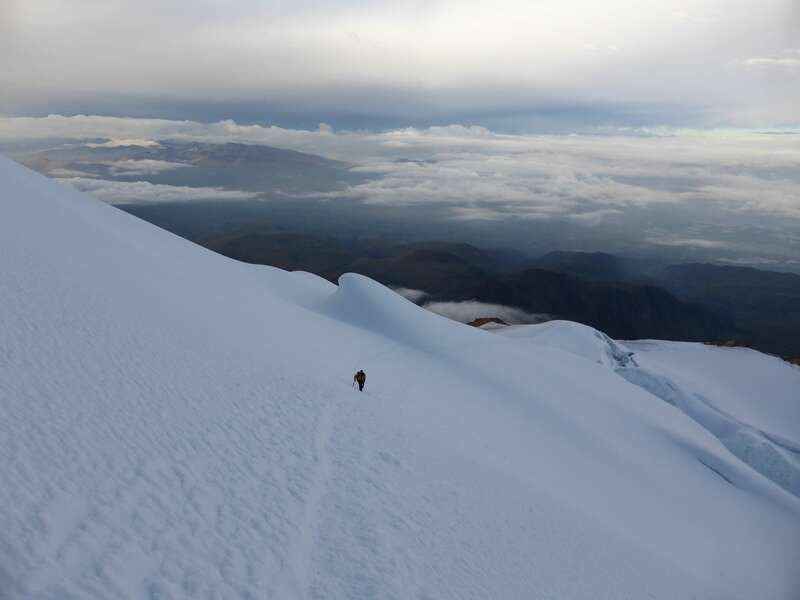 Cayambe was an interesting and rewarding climb. 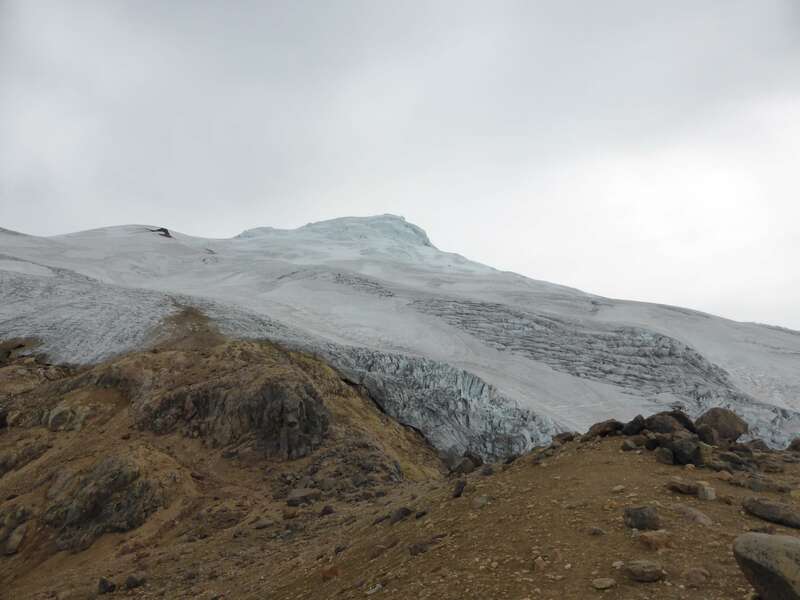 The terrain higher up the glacier felt steeper, physically more rigorous, and much more sustained than that of Cotopaxi a few days later. 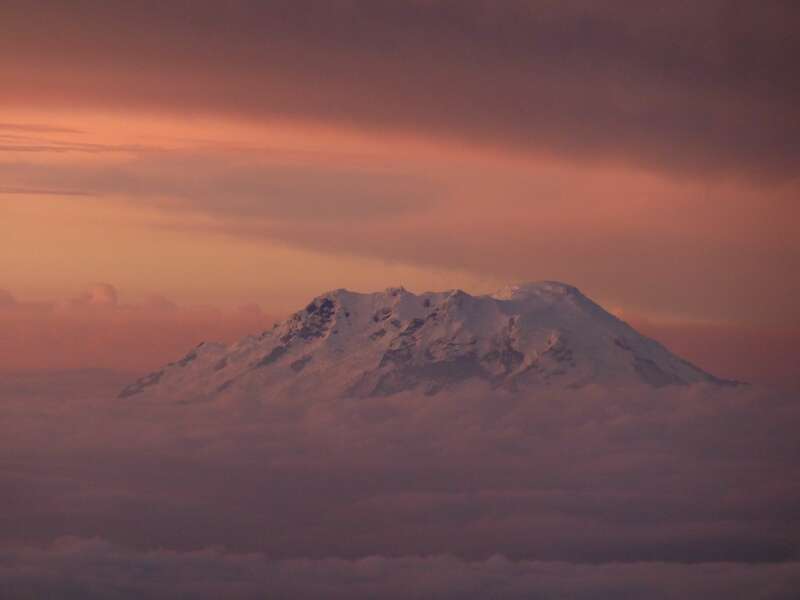 The sunrise on the summit was a rare, unforgettably beautiful event. 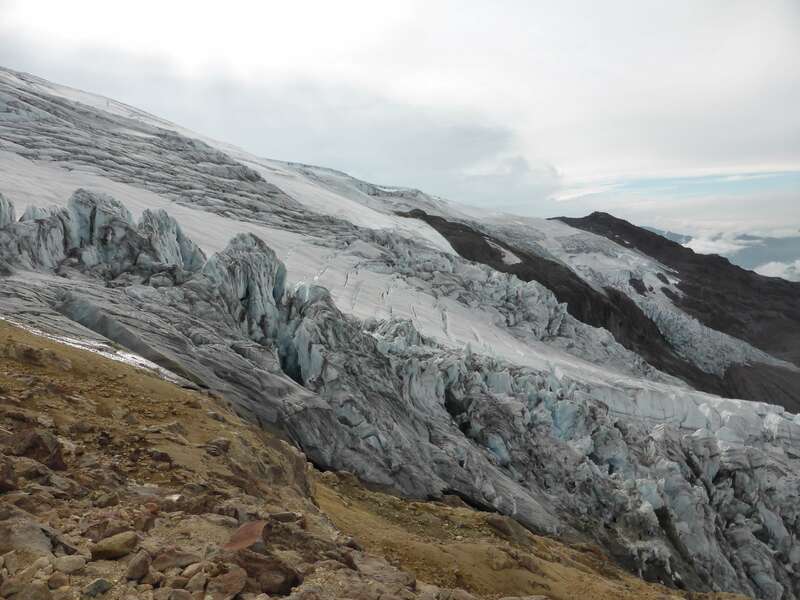 Cayambe’s glacier is known for its activity and the numerous crevasses on route. Navigating the lower glacier in the dark with my climbing partner and mountain guide Pato was good practice and a great experience. 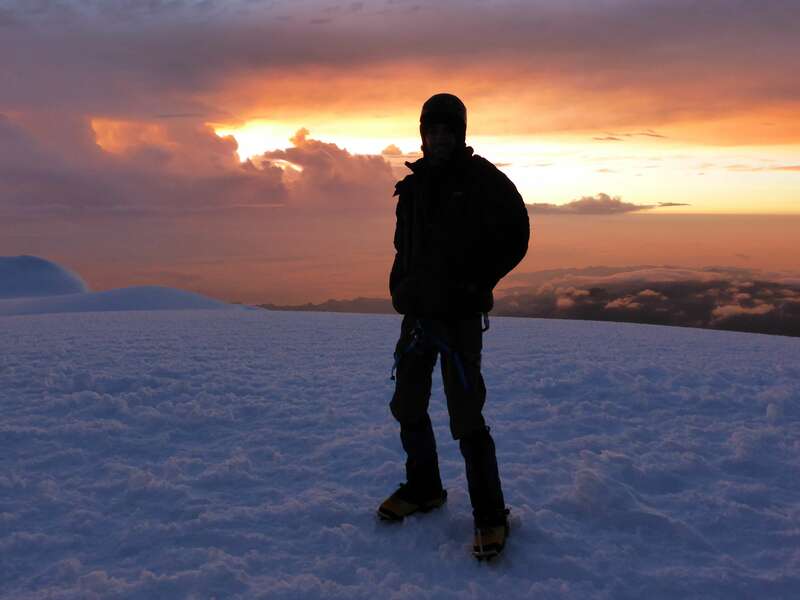 If I were to return to Ecuador, I would absolutely make a point of revisiting Cayambe. Cayambe is fairly accessible, although slightly less so than Ecuador’s more popular mountains. 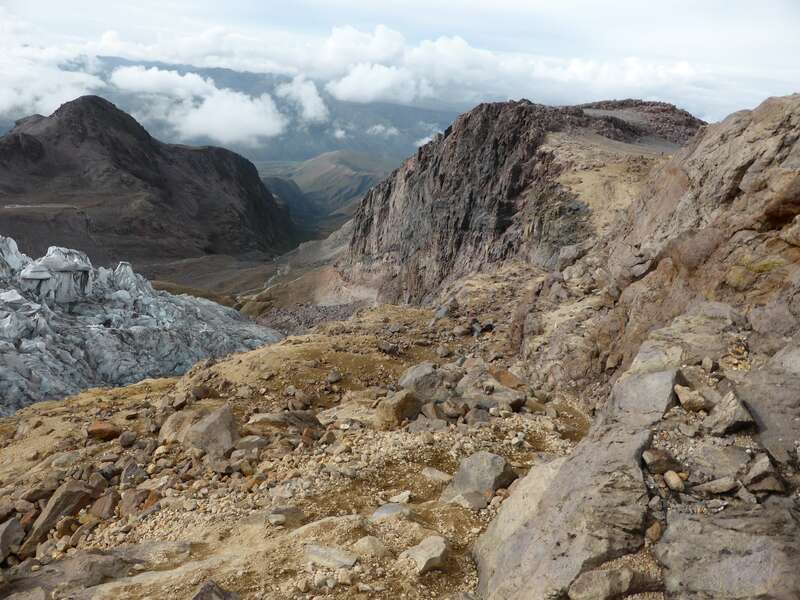 The town of Cayambe is only an hour’s drive from Quito, but the mountain refuge must be accessed via a rough road requiring the use of a 4×4 truck. 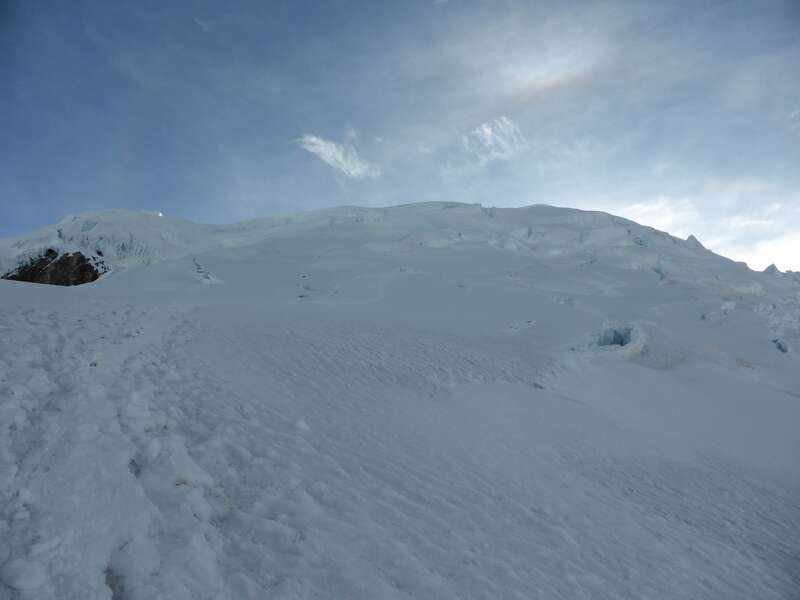 Climbing Cayambe involves moderate glacier travel, and thus some prior experience with cramponing and ice ax self-arrest. 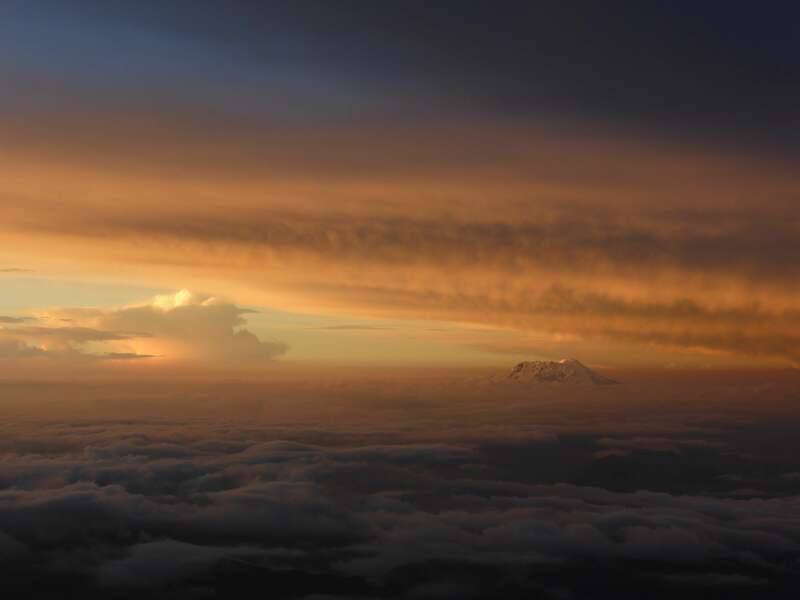 This entry was posted in Ecuador, Mountaineering and tagged Antisana, Cayambe, Cloud Ocean, Ecuador, Machachi, Reventador, Sunrise by Ian. Bookmark the permalink.